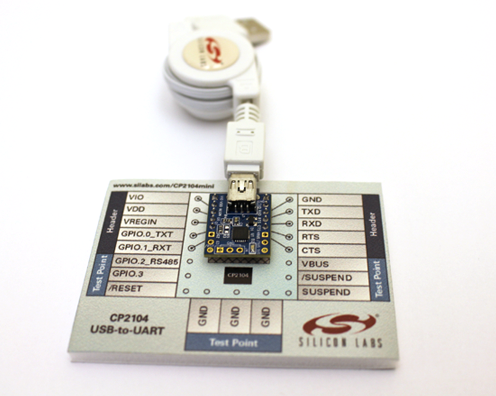 Viswa wrote to us about the USB-to-UART CP2104-MINIEK (mini evaluation kit) from Silicon Labs available for $5. This entry was posted on Thursday, May 29th, 2014 at 9:00 pm	and is filed under Interface. You can follow any responses to this entry through the RSS 2.0 feed. You can skip to the end and leave a response. Pinging is currently not allowed. Should be worth noting that the cheapest shipping (at least for me in California) is $26.00. And of course you don’t find out how much it is until you’ve given up all your personal information / email etc. Oops! Thanks for letting the rest of us know, anyway! Seems hardly worth the bother when USB-UART devices are available for $2 (including shipping) from ebay. You can get either CP2102 or PL2303HX at that price. Maybe they are knockoff clones, but they work for me. You can buy it from Mouser and use the economy shipping. I think it’s $5. As of right now, mouser has 77 in stock for $5. Definitely worth adding to my next order. Seems way nicer than one of those crappy ebay fake PL2303HX adapters. The ‘crappy’ pl2303 adapters will do 6mbps. Are they still not releasing the Android device driver? I have several devices I’d love to interface to my phone but cannot because SL won’t let “just anyone” have the driver. I checked the site too, its $26 to ship to NY as well. So it doesn’t seem to matter where in the country you are in shipping cost.